# Wash, drain the cucumbers and cut both ends. # Place the cucumbers in a 1lt sized jar vertically, you should fit cucumbers in it so well, put pounded garlic between cucumbers. # After placing, fill half of the jar with water and the other half with vinegar. # Then pour this mixture of water and vinegar to bowl, and add salt and lemon juice in it and then mix very well. # Fill this mixture in the jar again. # And add the parsleys without chopping or etc. # Cover the lid very well. It is so important, it must not contact with air. Store in a dark and cool place. # It will be ready to service in 10-15 days. 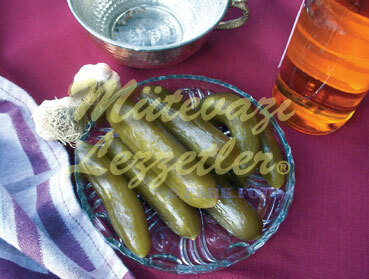 Note: In a few days cucumbers may absorb whole liquid, you can add pure vinegar at that time.